A footwear manufacturer in India, Ducere Technologies has produced a pair of shoes that can guide the user towards their desired destination by only giving a vibration signal. 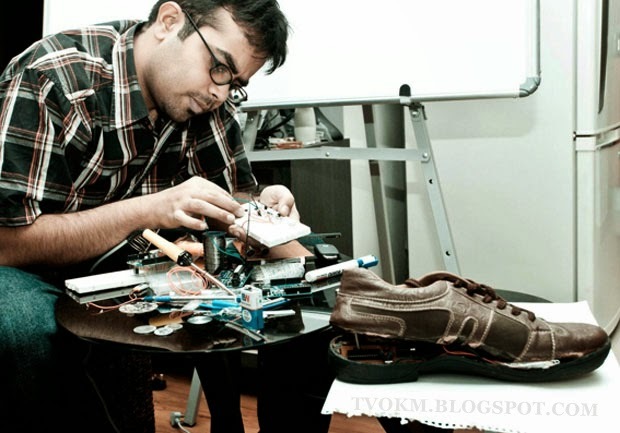 The shoes were collaboratively designed by Krispian Lawrence, 30, and Anirudh Sharma, 28, known as Mr. Lechal has the Bluetooth equipment connected to the mobile phone mapping system. Using technology 'guides the foot,' the information received from the mobile phone to be used as input for driving directions by using the vibration signal. In addition to navigation, Lechal is also able to calculate the number of steps taken and calories burnt by users when engaged in activities such as running and walking. Shoes are priced at U.S. $100 (RM 323.81) is easy to use, other than increasing safety on the road. When riding a motorcycle or bicycle, you no longer have to look at your phone to find a location, because the act could put you in danger. Instead you will be guided by these shoes. The shoes were sold in liner, which can be placed in any shoe on a tendency by a user. The shoes were sold as liners, which can be placed in any shoe of the user's choice. Although these shoes are only marketed worldwide in June.